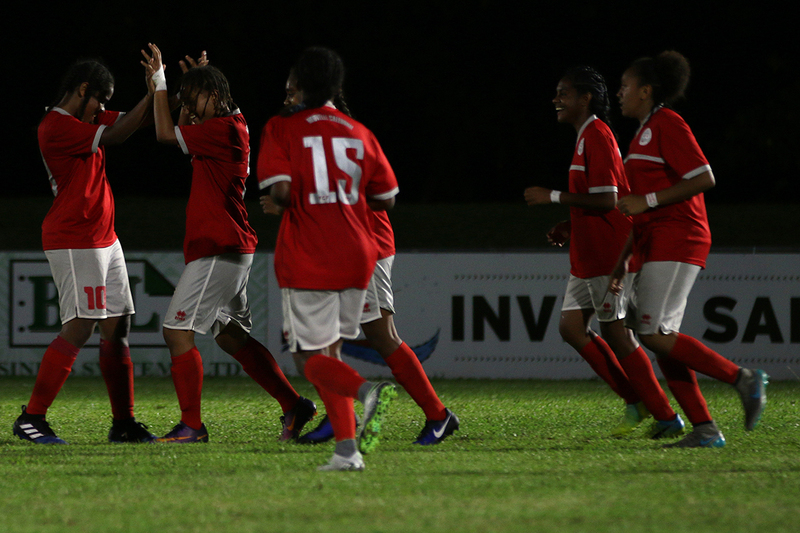 New Caledonia have earned a rematch against New Zealand in the U-16 Women’s Championship 2017 final this Friday after defeating Fiji 4-2 in their semi-final clash tonight. New Zealand secured their place earlier in the day with another strong win, dominating Cook Islands 9-0 despite an impressive game from the knockout stage debutants. The defending champions struggled to find a gap in the crowded Cook Islands backline in the early minutes but after adjusting to their deep defensive structure, Kelli Brown broke through to open the scoring in the 18th minute. After Maggie Jenkins followed up with two quick goals, Brown slotted in two more to bring New Zealand’s tally to five. Captain Maya Hahn was the next to get her name on the scoresheet, finding the net from the penalty spot after a handball in the Cook Islands box. Substitute Margot Ramsay – who came on in place of Maggie Jenkins in the 36th minute – was the last goal-scorer of the half, sending the ball past goalkeeper Dora Iripa only six minutes after taking the field. Cook Islands held their heads high when they returned to the field and continued their defensive game, letting only Jayda Steward and Grace Wisnewski find the goal and holding out New Zealand to a single digit score. Although their exit from the competition is earlier than hoped, Cook Islands coach Theresa Tutuava was overjoyed with the milestone her team has reached in the competition and proud of her young team for fighting until the end. “We knew our chances were not that great but I’m proud of the girls – this is the first time they’ve played in a formation they have never done before against a very strong team,” she said. “It is huge playing against a team like New Zealand and hopefully our players will learn from this experience and be proud of their performance tonight. Despite Cook Islands’ formation causing trouble for New Zealand in the opening minutes of the game, New Zealand coach Leon Birnie was pleased to see his side adapt to their structure and be more clinical in their execution as the game went on. “I was quite impressed with the girls today. Cook Islands showed their intent straight away – that they were going to set up defensively – and in the previous few games it has taken us a while to put the goals in the back of the net,” he said. The later match saw a far closer battle with Fiji and New Caledonia scoreless at half-time but the Francophones stepped up in the second half – just like they did in their previous match against Tahiti – to win 4-2. New Caledonia’s first goal came only two minutes into the half when Fiona Ihage connected with a corner and Jackie Pahoa extended their lead three minutes later after receiving a perfect through ball from Marie-Laure Palene. Katinka Takamatsu got her name on the scoresheet in the 64th minute to bring New Caledonia’s tally to three but the Fijians kept fighting and managed to get one back after Emily Rokociri connected with a corner. Edsy Matao wasted no time after she took the field following Fiji’s goal, using her fresh legs to break through the Fiji backline and bring New Caledonia up to four goals only 10 minutes later. Both teams lifted in the last minutes of the match as Fiji fought desperately to equalise but despite a final goal from Lusiana Lagilevu closing the margin, New Caledonia’s lead was too high for the Melanesians to catch. New Caledonia coach Matthieu Delcroix was overjoyed to reach the final of the competition and believed the win was well-deserved after another whole-hearted but well-structured performance from his team. “It feels great to make the final. Last year we lost in the semi-final after a good match against Papua New Guinea because we didn’t score the goals we needed to score,” he said. Fiji coach Marika Rodu was heart-broken with the result but proud to see his team develop their structure and mentality throughout their tough OFC U-16 Women’s Championship campaign. “The girls gave it their best. In the first half they were too reluctant to push up but congratulations to New Caledonia – I think they were more hungry to make it to the final,” he said. “We could only stretch the girls so far. They gave their best until the end of the game but we had some injuries and girls playing in strapping. All we can do now is learn from the experience and continue improving.